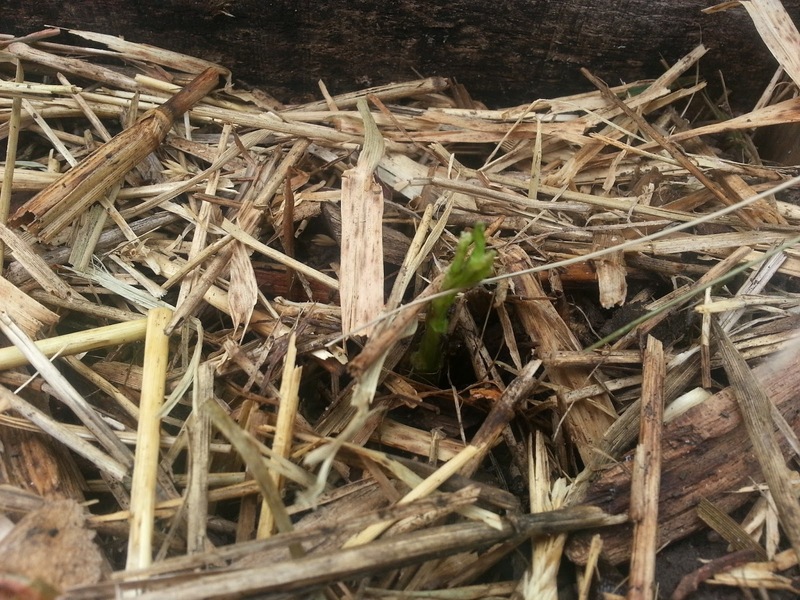 Last year I wrote about a mysterious "waxy" substance on my harvested garlic cloves. I chalked it up to "oh well, try again next year." We discarded or cut out the waxy parts and didn't use them to plant the 2013 crop. In July, I harvested the crop and hung them in the garage to dry and cure. In October, I cracked open dozens of crowns to find the fattest cloves for planting the 2014 crop, and to my dismay, I found more of that waxy substance, plus some rotten looking cloves. This time, I knew who to call, and handed some samples over to Brian Hudelson, senior outreach specialist with the UW-Extension plant disease diagnostics clinic. Each summer Brian pays our community garden a visit and is always interested in seeing dead and dying plants. I thought he'd enjoy seeing these samples. I received an analysis today, and here's what Brian wrote. I have completed the analysis of the garlic sample that you submitted to the Plant Disease Diagnostics Clinic. I initially showed your sample to Phil Pellitteri, our insect diagnostician, for comment. Phil found evidence of Indian meal moth larvae in the sample. This insect tends to attack stored garlic. Please see the attached fact sheet for details on this insect pest and its management. Phil also found evidence of bulb mites in the sample, but commented that these mites are commonly found in soil and likely invaded your garlic after it had been compromised by other factors. I subsequently used standard isolation techniques in an effort to recover disease-causing organisms from your cloves. I did recover some Fusarium from the materials that you provided and this fungus can cause clove rot issues on garlic. I am enclosing a photocopy of some information on the disease caused by this fungus. In addition, I believe that part of the problem with your garlic may be something called waxy breakdown, a high temperature-related physiological disorder. I am enclosing a brief description of this disorder as well. In terms of management, I think the best way to proceed is to simply inspect the cloves you have in storage, and dispose of any with significant blemishes and/or discolorations. If you decide to use any of your cloves to replant next year, be sure to reinspect them prior to planting and use only blemish-free cloves. 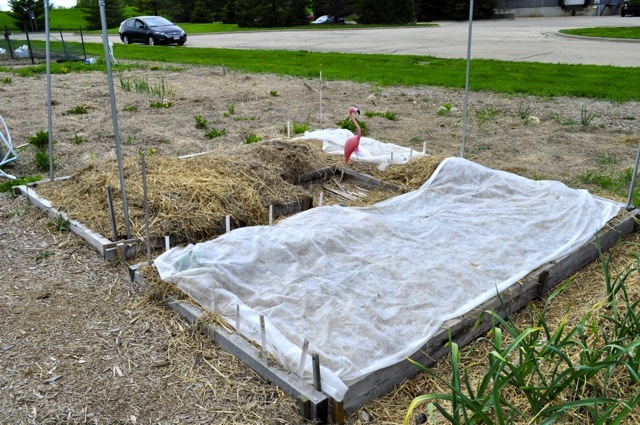 Also try not to replant in the same area of your garden plot where you had garlic last year. I hope this information is of help to you. Please let me know if you have any questions. Thanks again for using the Plant Disease Diagnostics Clinic. I did not use any of the waxy cloves for next year's crop. In fact, one species seemed to be particularly affected and we ate or destroyed all those cloves. I'm going to put a moth control strip near my garlic. 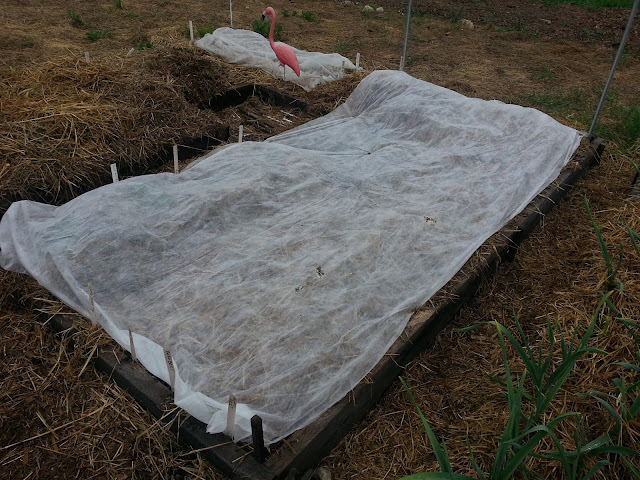 I did rotate the garlic into a new bed. I came across this 6-minute video about urban farming in New York. I mean, these folks aren't kidding about urban farming - they're growing tons of food on rooftops. Beautiful video footage too! I am am member of First Congregational United Church of Christ. If you live in Madison, that's the big church next to Camp Randall Stadium. On Nov. 10, our minister, Eldonna Hazen, opened her sermon with a lovely garden analogy that I was so moved by, I asked her if I could share it on my blog. The overall theme is about recognizing, and sharing our gifts. I hope you enjoy it as much as I did. If you look at the cover of the bulletin today, you will see plants growing from pots. 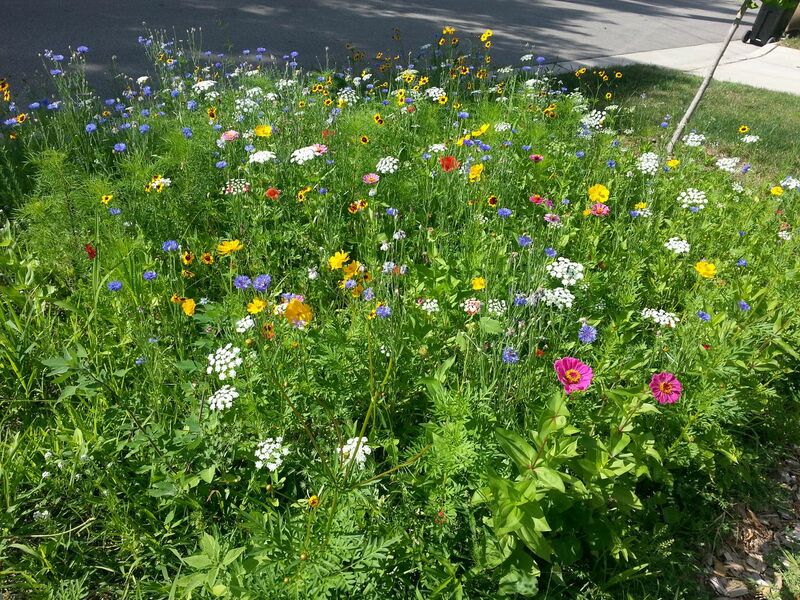 Each of these seeds has been planted deep in the soil and surprisingly pushed its way through soil to grow. Some of the seeds we plant gift us with food, some gift us with beauty. Some of these seeds will surprise us in ways we hadn’t ever imagined. They may produce the biggest watermelon or carrots or potatoes we have ever seen. 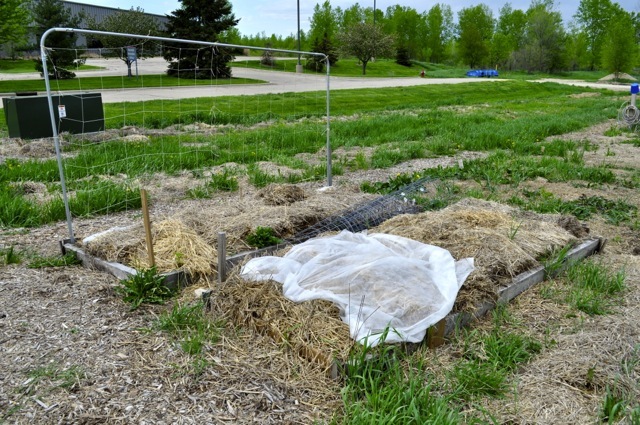 Some of the seeds may produce the smallest onions or tomatoes. Some of the seeds may even surprise us by being something other than what we thought we were planting. “I could have sworn I planted red roses, why are they yellow?” Or maybe we were sure we planted broccoli and we got cauliflower. Seeds have a very interesting way to surprise us. We plant them deep in dirt, we water and weed, but we don’t really know what we have until it pushes through the soil and surprises us. And in my case, who cares what was planted, I’m just excited and surprised when something I planted actually grows out of the ground. These are surprising gifts. Gifts that will now bless us with a bounty we hadn’t imagined or envisioned, but are ours to share. I will admit, to the avid gardener these surprising gifts could carry some frustration. But ultimately, I’ll bet every gardener would find use for the bounty that has blessed their garden. 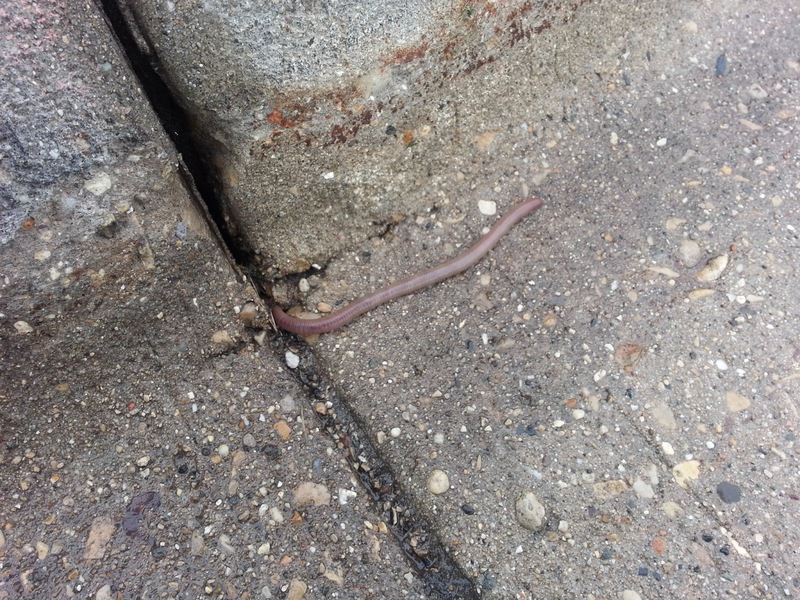 We certainly don’t have to look too far in the First Congregational garden to find many gifts. Over the last months people have shared “Because of your generosity” moments. People have reminded us of the many ways this congregation touches and is touched by generosity. First Congregational is able to change lives because we are willing to use the gifts each of us knows that we have within us. But what about the surprising gifts? We all think we know our gifts pretty well. What if we took the time to re-evaluate our gifts? What if we were surprised by what we had to give? Then, what if we surprised others with our gifts, so they too, could benefit from our gifts? I don't drink coffee, but by the smell of the inside of my car, you'd think I had a more than a little coffee problem. Well, you're right, but not the problem you're thinking. Sometimes I wonder if the coffee odor inside my car is so strong it's permeating the fabric and other materials and long after this coffee jag is over, my car and I will both continue to smell like a rude mix of dark roasted vanilla hazelnut espresso. I'm in a race against the first significant snowfall to collect coffee grounds from cafes across Madison's east side to turn wood chips into organic matter by next spring. Why coffee? What's the rush? Coffee grounds are an excellent source of nitrogen. Great compost organic is created by mixing the proper amounts of carbon (in my case, wood chips) and nitrogen (all those coffee grounds). There are many ratios depending on what goes into the compost mixture, but typically, it's a Carbon:Nitrogen ratio of 20:1. Too much carbon and it stays a dry heap. 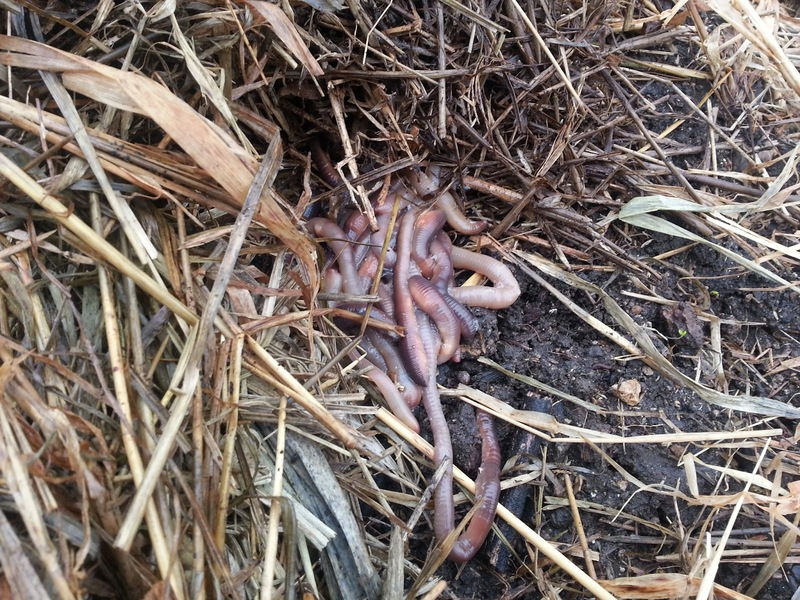 Too much nitrogen and it gets too hot and kills all the good organism OR it turns into a sloppy, smelly mess. Get the ratio right and it warms up, decomposes and results in a lovely compost for the garden. In our back yard and on the terrace between the sidewalk and street, Jay and I put down a heavy layer of wood chips to kill the grass in preparation for garden beds next year. The wood chips alone will kill the grass but won't be a great medium for planting next year. Enter the coffee grounds. I pour them on the wood chips, rake them in and let the two work it out. So, before the snow covers up the wood chips, I want to cover and rake in a lot of grounds so the wood chips have time to decompose over winter and into next spring. For the third year, I had the priviledge of representing American Family Insurance at the annual Sustain Dane Badger Bioneers event. Bioneer is (Bio + Pioneer). Bioneers are social and scientific innovators from all walks of life and disciplines. They are engaged citizens who focus on solving our world's most urgent problems within a framework of interdependence. I think what I like the most about the conference is the diversity. I met UW students from all over campus, interns at various businesses and non-profits, vendors who have products and services to help businesses become more sustainable, and people who are gardening in their back yards and community gardens and are interested in meeting like-minded people (ok, so that last chap was me). I attended my third Community Action Coalition (CAC) community garden potluck and networking event Monday night, Nov. 11. Each year it feels a little like homecoming, when many of us who are passionate about community gardens gather to share successes, winge (but just a little) about garden problems and share ideas. One idea I got from Melissa Gavin might just make me a super hero in my garden next spring. She has a simple recipe of vinegar, salt and soap that will turn Canadian Thistles into wispy crispies. Melissa mentioned in passing she found the recipe on Pinterest - I found one that sounded like here recipe. I also met a farmer who specializes in small-scale tilling and soil prepping. We may need him next spring if the American Family community gardeners decided to convert our "vine" or pumpkin patch into more plots. It was also a delight to reconnect with Annette from the Atwood Community Garden. 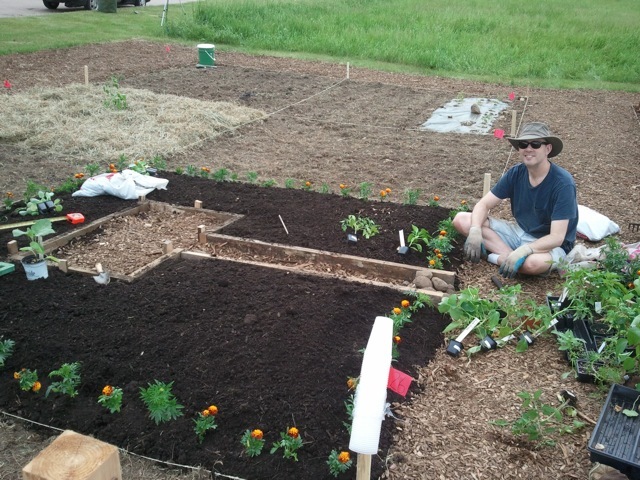 Two summers ago I helped a friend reclaim a weedy plot and Annette lent us a little rototiller. The diminutive machine was GREAT since I had to literally climb up an into the 2-foot tall accessible plot. Finally, I got to sample some great food! Pumpkin soup. A broccoli soup with a touch of cayenne. Some amazing apple desserts. And a sourdough bread with sage butter. OMG. But the best part was sitting around the table, good food on our plates and even finer company. I sat at a table for "garden leaders," there were other topic tables as well, like food pantry gardens, and gardens in southwest Madison. Thanks to Shelly and the staff at CAC for organizing and hosting this dinner. I find it rewarding and very helpful. Like I said, it's kind of like going back home. Last spring, my husband and I decided to build an orchard at our newly-purchased home. We could have put it in the back, but I proposed installing the orchard in the front. One of my goals was to make the orchard a focal point for the block, and a learning opportunity about growing perennial food, alternatives to grass lawns and to build community. One way to accomplish my goal was to include our neighbors in building it and harvesting from it. Just about a year ago, I walked door to door introducing myself to everyone on my block. I apologized for the giant piles of dirt, wood chips and hay bales spilling into the sidewalk. I explained that we were about to install an orchard for everyone on the block to enjoy. And finally, I invited people to stop by to watch, and pitch in, if they wanted. On installation day, 25 people from many circles of my life showed up, including five neighbors. In four hours, we moved seven tons of compost, spread 25 bales of hay and planted eight fruit trees. It was, by all accounts, wildly successful. More than a month later, another remarkable event happened. My neighbor, we’ll call her Gloria, walked by while I was in the front yard. She’s on a fixed income and has a hard time getting around and immediately apologized for not being able to help plant trees. I told her she was participating by enjoying it. Then she lifted a small pack of flowers out of her walker’s basket, saying she found them on clearance at a local nursery. I accepted them them as precious gems, and thanked her for the beautiful gift. I asked myself, “Did the block really change that much?” Or had Gloria’s perspective changed? Then I realized it didn’t matter what changed. Somehow, eight fruit trees in my front yard helped Gloria feel like she belonged. Turns out, I didn’t build an orchard, I started to build a community. Watch the four-hour orchard installation in six chaotic minutes. 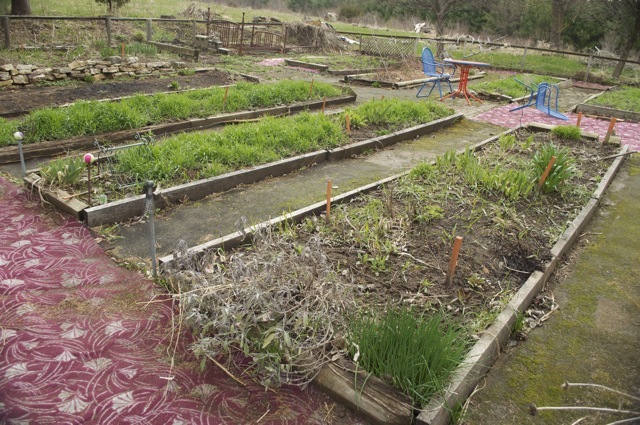 Jay and I cleaned out our community garden plots today. We pulled up the brussels sprouts to make room for garlic - too bad, it would have been nice to get them closer to Thanksgiving. The good news is that we planted seven varieties of garlic (200 cloves this year!) I used my own garlic from last year, and added two softneck varieties. A softneck failed on me in 2010, but I thought I'd try again with some that was actually grown in Wisconsin. We also harvested parsnips, which was a first for me. I am very pleased with the harvest. They too could have stayed in the ground for later harvesting, but it's much easier having two people to harvest them, one nudging them with a spade and the other gently pulling them up. We broke most of the tips, but didn't lose much "food." I love roasted parsnips, but what are we going to do with all of these??? We have lots of kale still in the plot (if it survives Sunday night's plunge to 28 degrees F). This year's lesson for next? More beets. Less kale. We've been eating a lot of kale chips, and I've traded kale (one big bag for peaches, another bag for blackberries). 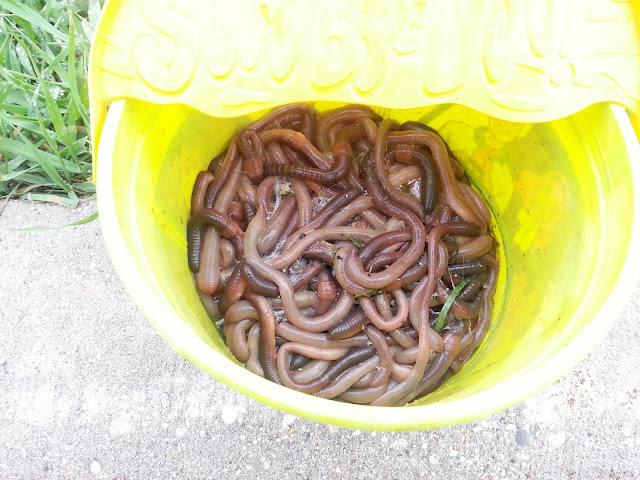 We're going to blanch and freeze some this week. We knew that tonight's temperatures will plunge to 28 degrees. That's not a frost, that's a hard freeze. Looking around the garden, there was a lot of produce that would be mush in the morning. Tomatoes, peppers, even some summer squash. It'll all be ruined in the morning. So... dear readers. Here's the question. Is it ok to go into other people's plots and harvest food that tomorrow will be useless? I'd love to hear your answers. Just a quick note that if you intend to plant garlic next year, you need to think about getting garlic seed stock now. 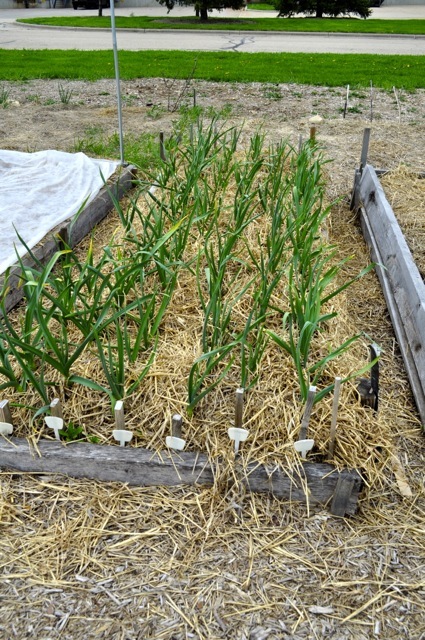 Garlic is planted in October, but you need to order your seed stock now! Many places that sell garlic for planting take orders now and deliver in October - but often stop taking orders in early September. There are many vendors, from your local farmers market to mail order nurseries across the country. The one place it's best not to buy from is your grocery store - garlic there is treated not to sprout - except organic garlic. I haven't been this excited about garbage in years. My neighborhood is participating in the East Madison organics collection pilot program, and this spring and summer I have noticed with envy my neighbors putting food scraps and yard waste into black bins that the roll out to the curb on trash day. Our house didn't come with a bin, and I wanted one. I learned that it's a pilot, and I requested a bin. So you can't imagine my excitement when I got the following email from George Dreckmann, the recycling coordinator, "We will get you signed up. This brings our Eastside pilot up to 302 households which is over our limit so we cannot add any more right now." In addition to the 35-gallon bin, we also got a 2-gallon kitchen collector with a close-fitting lid and a carry handle. We also got some compostable bags that allow kitchen scraps to ventilate and evaporate moisture while keeping smells and other nasty things in the bag. What I'm most excited about, to be perfectly honest, is the ability to include small amounts of yard waste. Seriously, that apple tree doesn't stop dropping fruit! 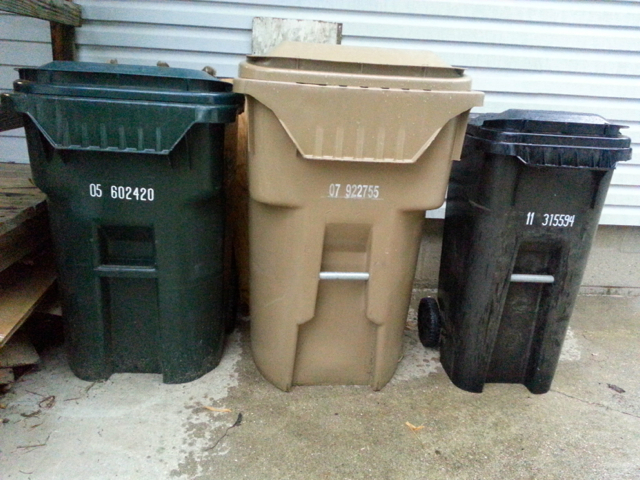 From left to right, green bin for recycling, brown for garbage, and the new little black bin for compostable materials. 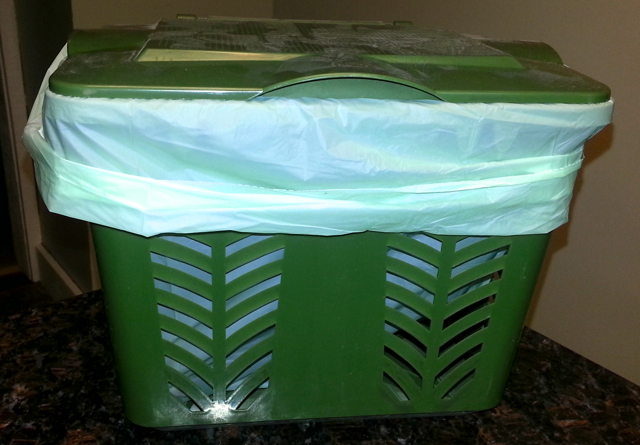 A 2-gallon kitchen collector with a close-fitting lid and a carry handle, and compostable bag. Many of these items cannot safely be composted in a backyard compost bin, but they will compost nicely in the large scale compost system where temperatures are high enough to kill harmful pathogens. 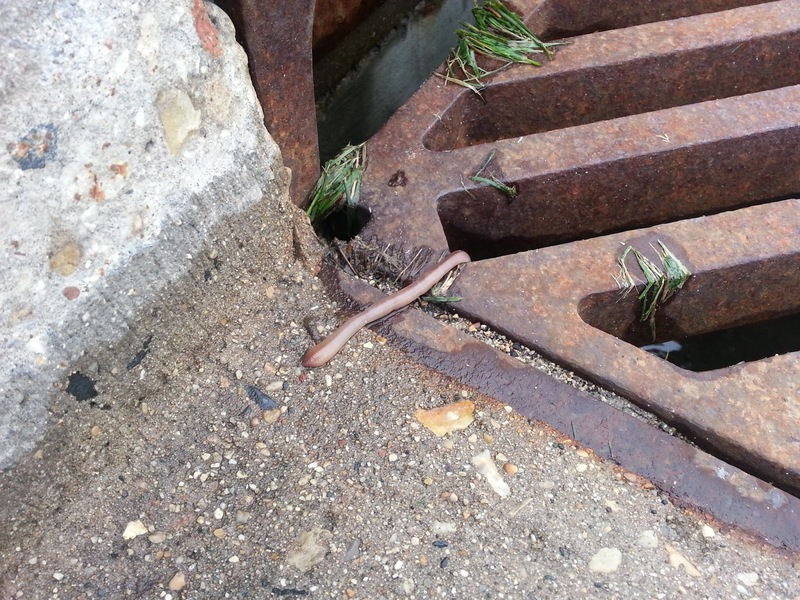 So while on the farm we fed food scraps to animals, and "composted" everything else, I'm pleased that we will be more deliberate in our urban setting. I was on vacation last week, and even though I picked every last sugar snap pea off of the vines, the vast majority of the crop matured and then over ripened while I was away. On Monday I spent 20 minutes stripping the vines and when I got home dumped a grocery bag full of snap peas on the counter to see the damage. Indeed, at least a third of them were overripe. The shells were far too mature to be pleasantly, so I split one open and tried a pea or two. They were a bit bitter. This was my first ever successful crop of snap peas, so I just couldn't throw them away. Instead, we decided to make lemonade out of lemons, or in our case, pea purée with basil and Parmesan cheese. I added some olive oil in a bit of salt, and we tossed it with some asiago cheese. As Mr. food was once want to say, "Oooo, it's so good." There is no way we'll eat all these peas, so I'm going to try to blanch and freeze the rest. First time trying that too! 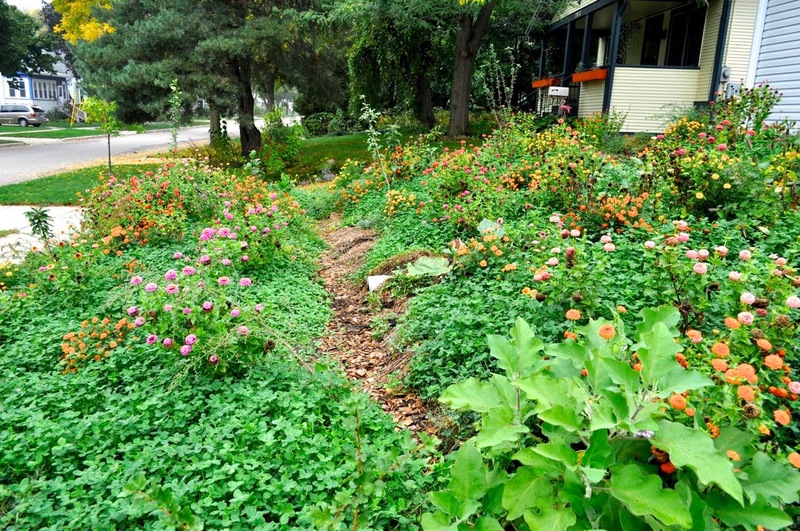 There are many reasons we built to our front-yard orchard. We wanted fruit trees, yes. But we planted them in the front to weave it into the fabric of our block, to create something for more than us to enjoy and learn from, and to share it. I feel the same way about the Little Free Library movement. 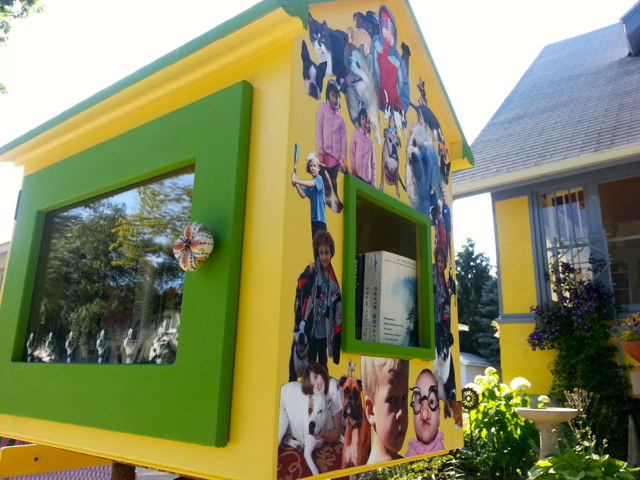 Have you seen one of these pint-sized wonders in your neighborhood? 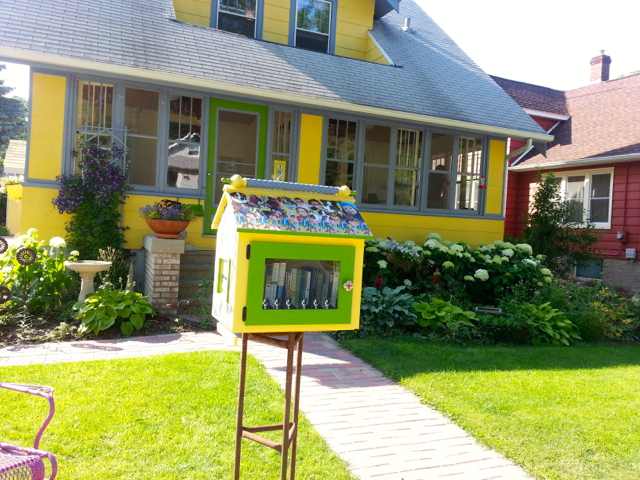 They are small lending libraries in front lawns and other public places around the world. 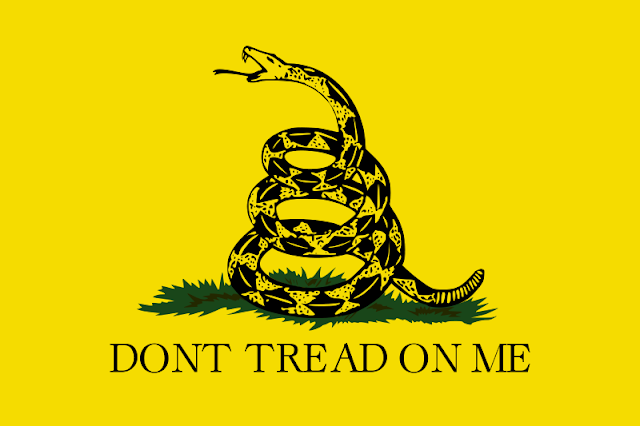 They reflect their owners or the neighborhoods where they stand. And I love spotting them around town. So you can't imagine how excited I was to learn that our neighbor, just across the street from us, was already putting one together for her front yard! And this week the 1900 block of Mifflin Street became home to the newest Little Free Library, #2805. The sponsor, MariLou, decorated it with images of young people and pets from our block, including our cats! I love how MariLou painted the library to match her colorful house. There are many ways to build community - I'm trying one with our front-yard orchard. MariLou is trying another. Together, they make a handsome pair on our block. THANK YOU to all who have helped me identify a few plants. 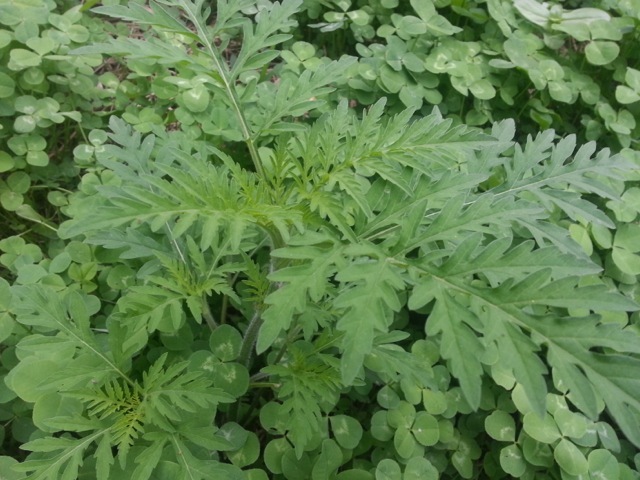 The ragweed and others are now pulled out of my orchard, and the trumpet vine is no longer threatening the house foundation or the neighboring herbs. I left some purslane in a few areas and I'll try nibbling on it. Now for a new one. We have an open space with freshly dug dirt and I noticed a plant today that I've never seen before. It looks "purposeful" if that's a term, but I have no idea what it could be. While mowing I spared it to see what it is. The green leaves have a silvery tone to them, and the stem and underside of the leaves are quite silvery. 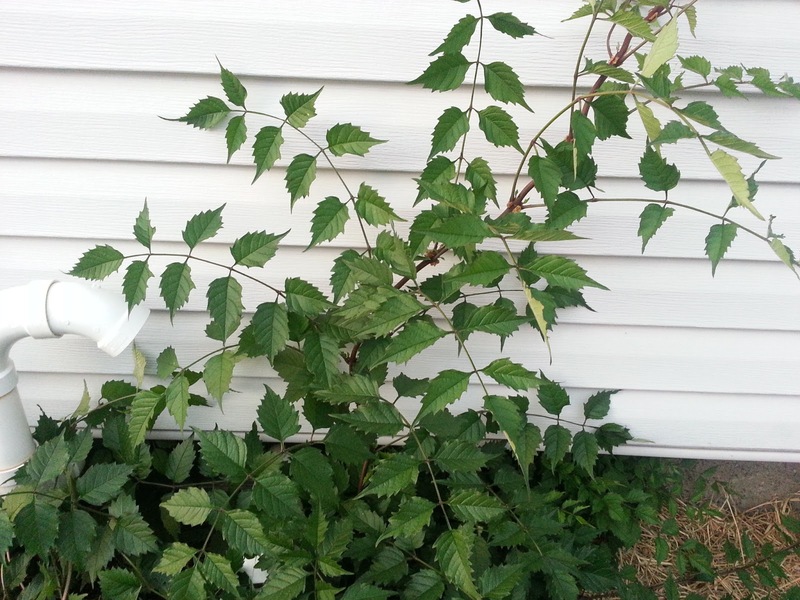 Thank you to the many folks who helped identify the following seven plants. Ragweed. I did my neighbors with allergies a favor and pulled it. Perhaps a type of mustard or shepherds purse, but as Molly wrote, "Anything that flowers that fast is suspect." 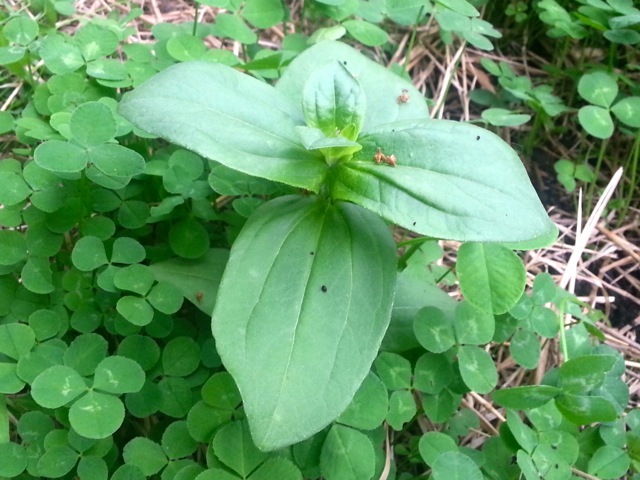 Math and Tamara think it's field pennycress. 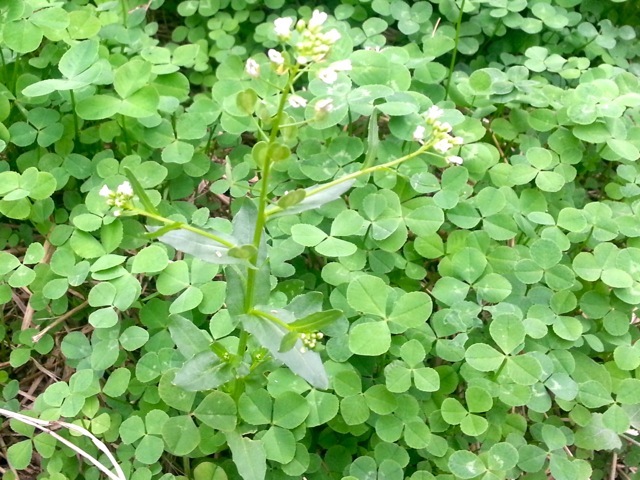 I pulled it, but oddly, before ID'ing it, I bought a pennycress plant from a farmer's market herb stall. Unsure, I pulled it. 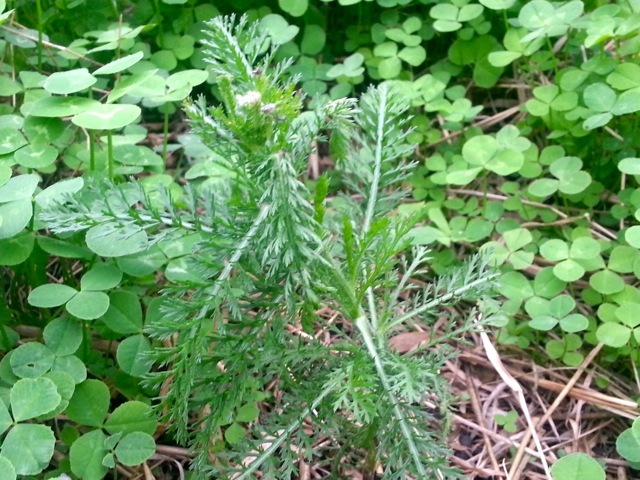 Yarrow, an insect attractor, tends to be on permaculture lists of "good plants." I did get one warning that it spreads and is hard to get rid of once it's established. I decided to leave it. 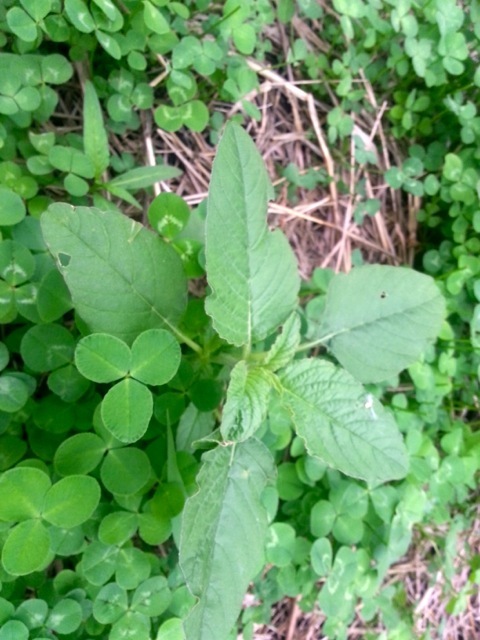 ID'd as pigweed or redroot, amaranthus. Most people thought it was edible, though one said no. I pulled it. Zinnia - an annual flower from seed I threw in with the clover just to see what would happen. The largest of these plants have a flower starting, I left it. Purslain - edible and delicious according to most people. I left it. This domestic number is fast outgrowing my patience. I'm going to hack it back this weekend. While the comments on my blog post asking for help identifying weeds don't reflect it, I got a lot of great email helping ID the plants. The comments function on the blog seems to be broken, my apologies for that. Regardless, here are two more plants to identify. This is a low-growing plant I found among my onions. Any ideas? Edible, useful? And this is a photo of a perennial planted near the foundation of our house. It's starting to vine all over the place. What is it? 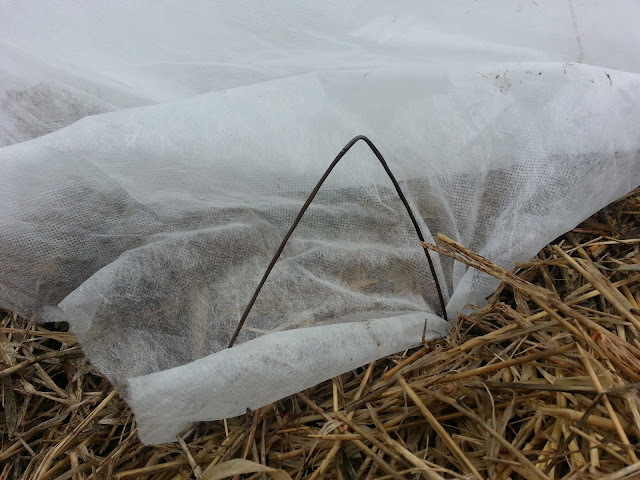 The other day I wrote a blog post about trouble I was having identifying weeds growing in the orchard. I've been weeding the orchard to give the clover an unfettered opportunity to create a solid ground cover to protect the soil, fix nitrogen and prevent weeds from coming up. 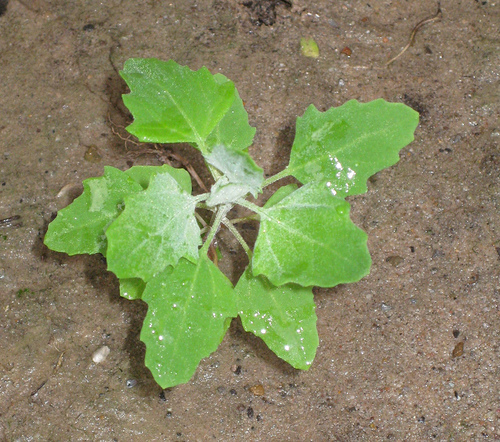 One weed I can readily identify is known to me as lambs quarters. I've also heard it called Aztec spinach. Regardless of the name, I think it's delicious. I pull the lambs quarters well before it goes to seed, which is also when it's tender and effortless to remove. And since the whole idea of this orchard is to be a food forest, I eat everything edible it produces. 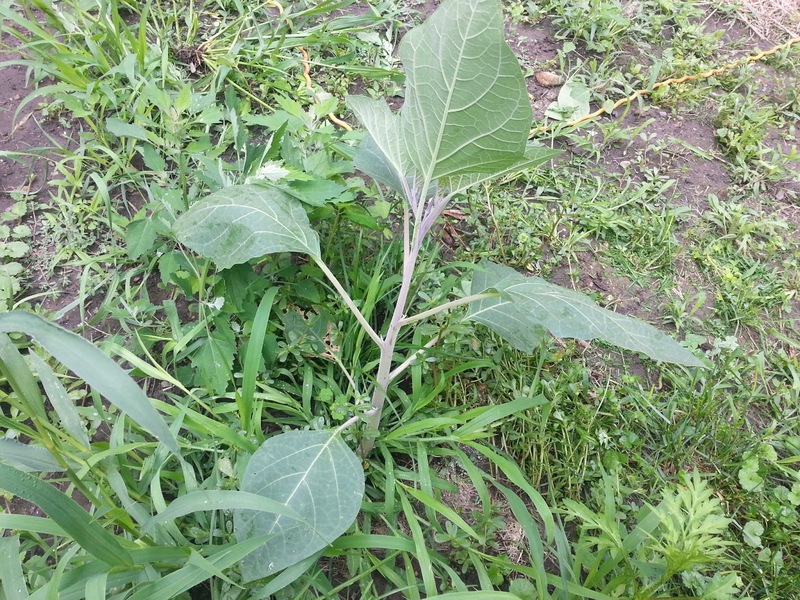 As I pull lambs quarters, I gather it in one hand with the roots facing the same direction. After weeding, I cut off the stems and roots with a garden shears, though taking them into the kitchen and chopping them off with a knife would've been fine too. Here are my two favorite ways to prepare this spring green. If you have a favorite way to prepare this green, or if there are other so called "weeds" that you eat, please share them in the comments. Rinse the leaves and stems and spin out in a salad spinner. Put a tablespoon of olive oil in a frypan and warm-up. 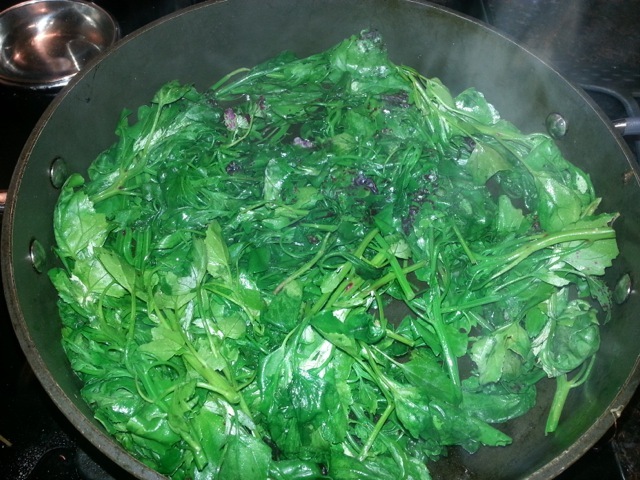 Put the greens in the frypan and turn a few times until the leaves are coated with oil. Then allow the bottom leaves to fry a little bit (we're not talking deep-fried here think stirfry), and stir them up a couple of times. Rinse the leaves and stems and spin out in a salad spinner. You don't need to get the water off, I just find this helps get the last of the dirt off. Put in a large saucepan with a couple of table spoons of water and a tablespoon of your favorite vinegar. over and steam for just a few minutes. 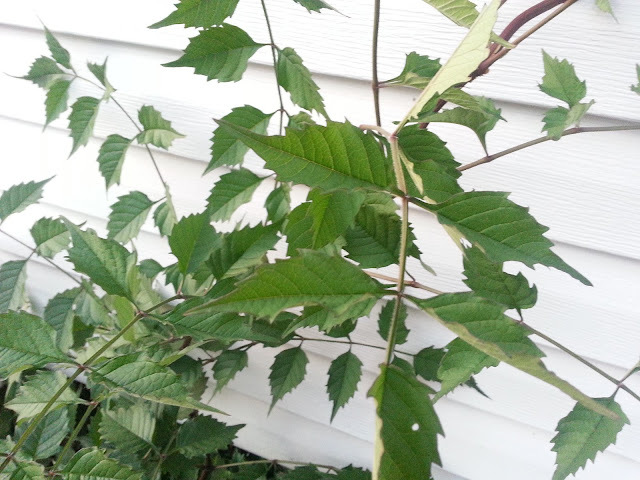 The leaves will turn a bright green, will wilt and the stems will become tender. I'm pretty good at identifying annual vegetable plants. I don't know their family names (although I am learning) but I can tell you what's a tomato, what's a squash, and what's an onion. And compared to annual vegetable plants, I can pretty easily identify what a weed is; weeds are what's left after I identified the vegetables! 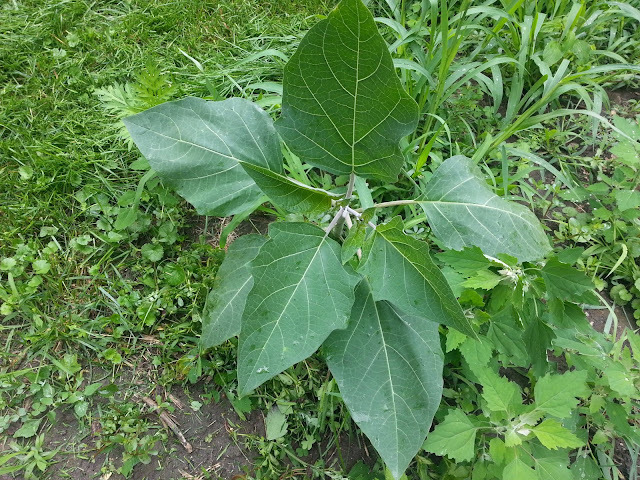 While weeding the orchard this evening, I realized there are some plants I'm having a hard time identifying. 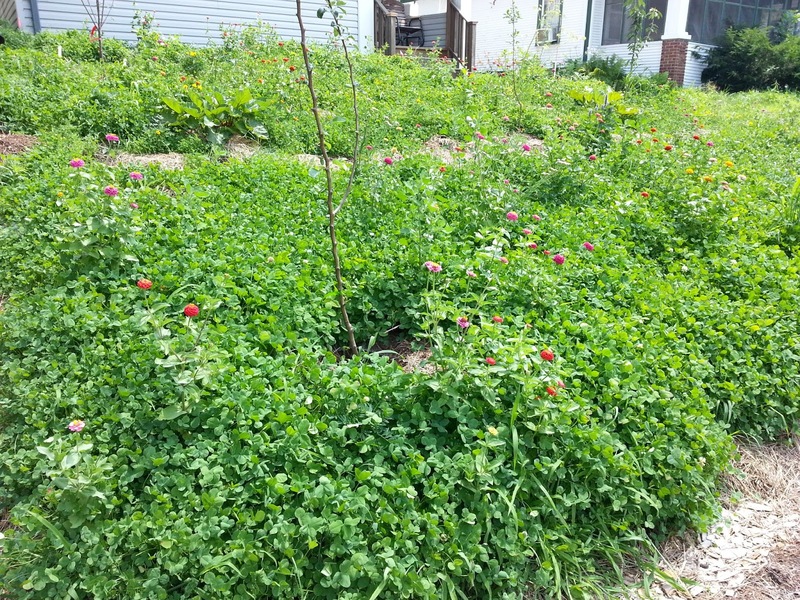 The majority of the orchard groundcover is white Dutch Clover, a low growing groundcover. 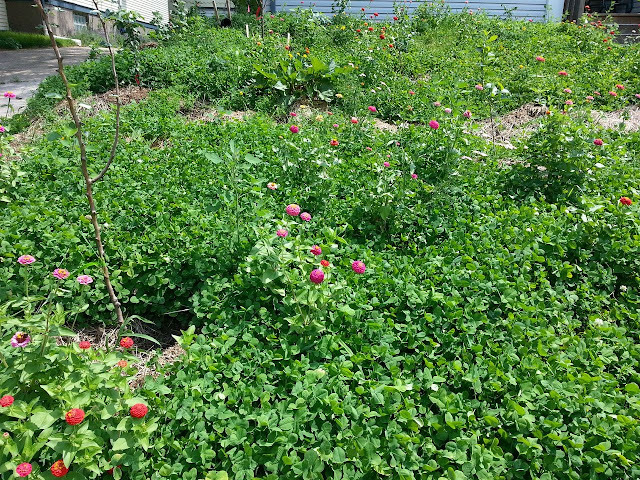 However, when I planted the clover, I found some packets of flower seeds and mixed them in with the clover; and I don't remember what I sowed nor what they're supposed to look like. 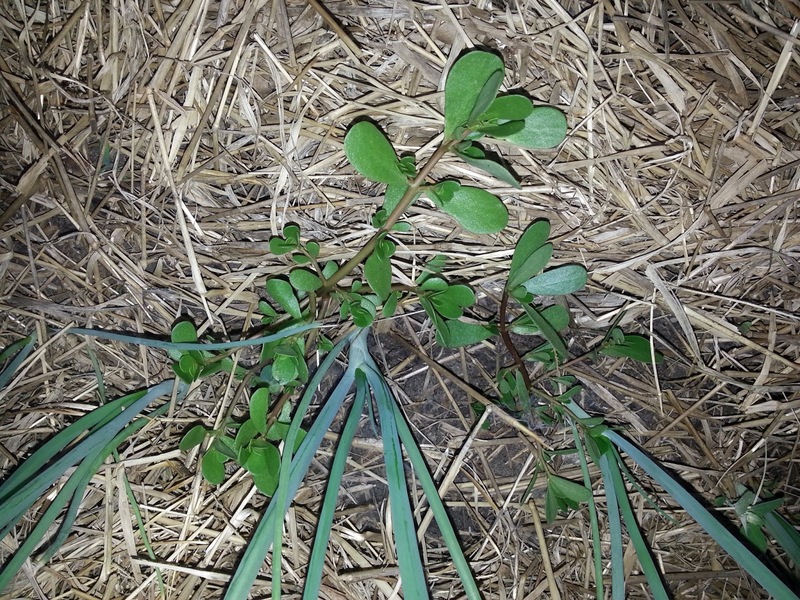 Also coming up in the orchard are lambs quarters and pig weed, both I can identify. If you can identify any of these, use the corresponding numbers and let me know what's growing. #1, looks a little like a cross between a marigold and a carrot. Any guesses? Weed or keep? #2, very upright, tubular stem, pretty white flowers. #5, maybe a flower, though I honestly have no reason other than to think that some of the flowers seeds must have germinated. Until we discovered kale chips. Then I was all over kale and started two varieties from seed this spring. After an unfortunate early spring sunburn when I killed four plants by putting them out without properly hardening them, the four replacements are growing and I harvested leaves after work today. Little known fact I can't prove but have heard - up until recently, Pizza Hut was the largest user of kale in the U.S. What for? Decoration around their salad bar. My bet is they don't turn them into kale chips at the end of the day. Rinse kale leaves and tear into "chip" size pieces. Tear the leafy parts away from the thick stem (compost the stem). The leaves don't shrink much, what you tear is pretty much what you get. Pat dry, though this is not really necessary. Maybe give them a spin in a salad spinner, or don't worry. They are about to get very dry. Oil a cookie sheet, I use an olive oil mister. You don't need much. 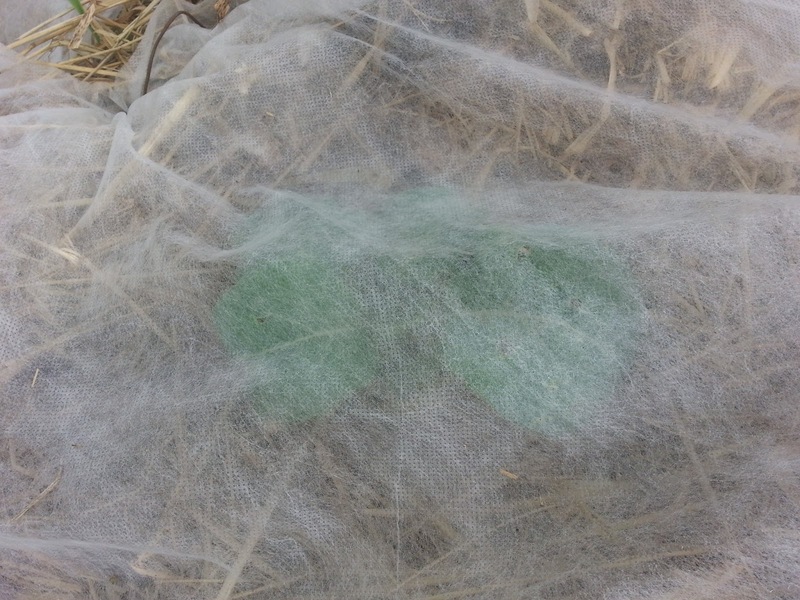 Lay kale leaves flat on sheet. Sprinkle a little salt on the leaves. 10 minutes in the oven; watch them, they can go from chips to charcoal quickly. Turn them over for the last 5 minutes. The don't hold heat, you can do this with your fingers. Some may be flattened on the tray, a little nudge with a spatula will get them off. I had enough for two trays, and I swapped the racks after turning chips over. After they are light and crispy, let cool on the trays. Store in an airtight container so they don't get stale. 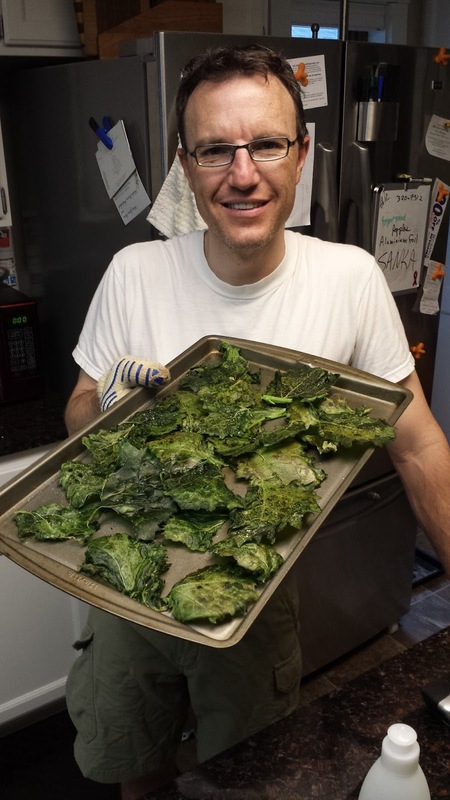 First harvest of the season, kale chips. What are your favorite kale recipes? While traveling for three months in Australia, I dug into the culture and watched the movie "Rabbit-Proof Fence." It's the dramatic true story of three aboriginal girls who followed a fence that had been erected in Western Australia to keep non-native rabbits on one the east side out of the pastoral grounds in the west. While I am not facing ultimate destruction of every living thing in my country, it certainly is starting to feel that way. I started to get this feeling when two weeks ago something ate all of the marigolds I planted in my community garden plot. "Marigolds?" I thought they repelled things, and were not interesting food for anything. I replanted them and this time stretched row cover over them and fixed in place with 6 inch ground staples. 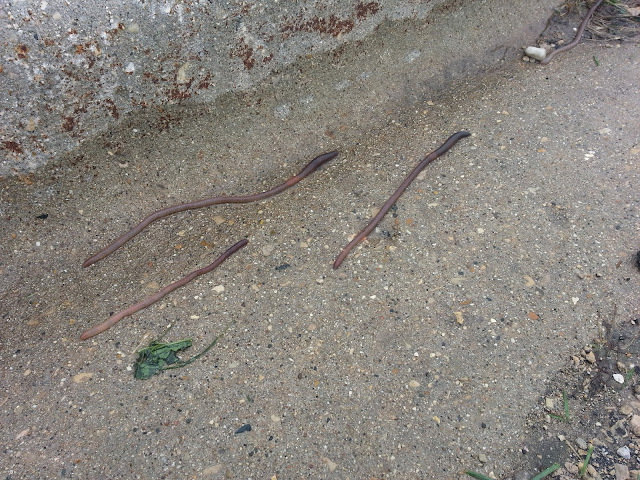 To my horror, the other day I found that something had pulled the ground staples out and ate all the marigolds. I also discovered this same creature ate an egg plant and a pepper plant! "A pepper plant?" This is the first time I've had any plant damage from anything but insects. It think it's fair to say the mammals have found our community garden. 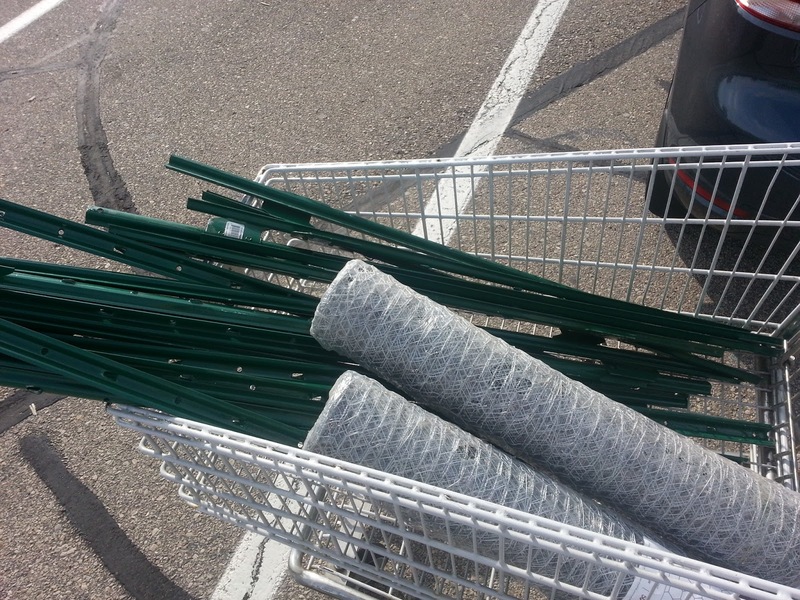 So Saturday morning before going to my garden to finish planting and doing a little weeding, I stopped at the hardware store and purchased fencing and fence posts. You have no idea how much this pains me. The aesthetics alone I find distasteful, the inconvenience even more so. 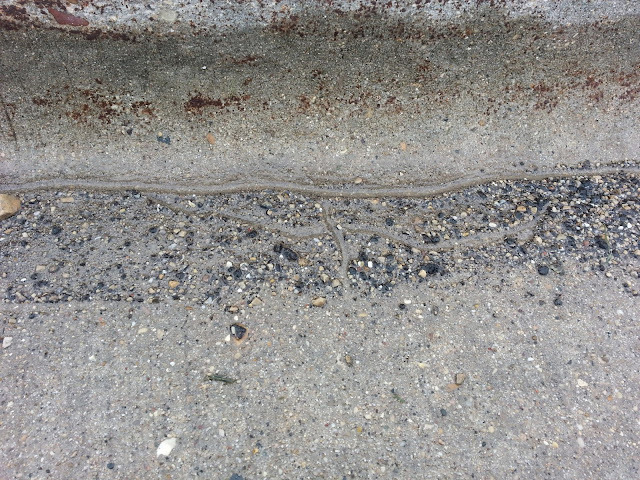 Then there's the maintenance, the sagging, the rusting, etc. Everything in my garden is once again covered in row cover, but has previously discovered this may not help at all. 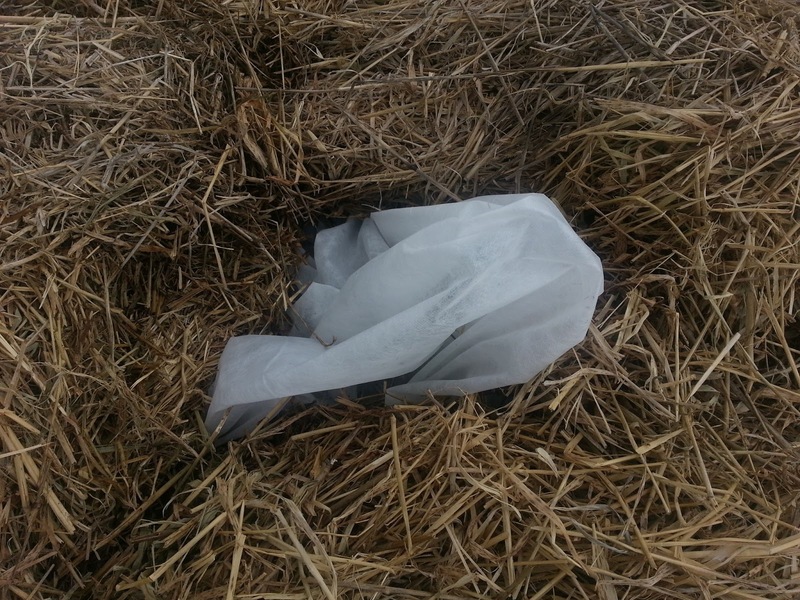 But I ran out of time on Saturday morning and so the fence posts and chicken wire remain in their original packaging. I know that if I don't assemble this I will return to my garden regularly and cry silently or yell loudly if no one is around. I also know each time I return after putting the fence up I will feel like I gave in to some four-legged creature that hasn't given me the courtesy of a thank you note. New photos as the fence goes up.